Caring for and maintaining joinery. It is inevitable that external joinery products will suffer from the elements. The extent of the damage caused will depend on many factors, including sunlight, water pooling, wind, rain, and ice. Northern Irelands climate is one of the worst kinds for external joinery. A typical day could consist of a heavy frost at 7am , raining heavily at 10am. At 1pm beaming sunshine to be followed by a drop in temperature and more rain by 4pm. Almost all the seasons rolled into one day. Therefore it is essential to maintain your joinery to get the most from your investment. High performance products such as aeroplanes, cars and central heating boilers all require some form of maintenance. A regular cleaning and maintenance schedule will ensure long life, efficient performance and visual appeal. Your joinery should be cared for in the same manner. Failure carry out essential cleaning and maintenance may, at best, ruin the appearance. At worst, it could lead to the early deterioration of your joinery. The most important elements to maintain are the protective coating system and the hardware. However, it is advisable to check the entire unit (interior and exterior) including the glazing and weather seals for any signs of deterioration. The level of maintenance required will depend on location and exposure to weather. 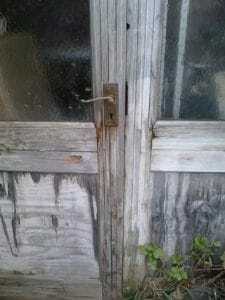 Wooden door and window maintenance really depends on the amount of direct sun and water exposure. The frequency of door maintenance varies with individual applications. For example, a door without an overhang or porch is going to weather quicker than a covered door. We recommended that the protective surface coatings, glazing units, weather seals and ironmongery supplied with our products are inspected at least annually for any signs of deterioration. Exterior joinery in a south facing position in a coastal area will deteriorate far quicker than if it is north facing and sheltered from the wind and rain. It is crucial to maintain the protective surface coating as it is a barrier from the weather. Moisture is the biggest cause of problems and should not be allowed to penetrate into the timber throughout its life. General cleaning should be carried out regularly (we recommend at least twice a year) using a soft cloth or sponge with a mild detergent and warm water to remove any contaminates. After cleaning, rinse thoroughly with clean water to remove all residues and then completely dry off. If any damage is noticed, then this must be repaired immediately. Areas subject to more wear and tear such as window and door cills and door edges, should be touched up as necessary. Lightly sand down the effected area with a fine grade sanding paper. Gently wash down with a mild detergent and rinse with clean water. Ensure that any dirt and dust is removed , and dry thoroughly. Apply the appropriate coating, to match the existing, to the area affected. Allow the first coat to dry for at least four hours and then apply a second coat. If the damage is widespread, it may require sanding down the whole unit. Carry out any repairs as necessary, apply one coat to the damaged areas. Once thoroughly dried, apply a second coat to cover the whole unit.